The Competition is on the level of its best thus challenging the candidates to go the extra mile. It is high time to work solemnly on every subject and every topic included in the exam syllabus. Considering the same, General Science an undeniably important part of General Awareness Section for RRB JE, RRB NTPC, SSC CGL, SSC JE, SSC CHSL, SSC MTS Exams needs to be studied thoroughly. And to make you do so, Adda247 brings the “The Cracker General Science MCQ Book for RRB JE, NTPC, SSC and other Exams 2019 (In English Printed Edition)” at just Rs.249 for all the major government exams which ensures a thorough improvement in your performance. With the motive of providing the most effective study content for exams concerning Railway JE 2018-19, RRB NTPC 2019, SSC JE 2018 , SSC CGL 2018 , SSC CHSL 2018 and other Exams, the first edition of “The Cracker General Science MCQ Book for RRB JE, NTPC, SSC and other Exams 2019 (In English Printed Edition)” has been developed in a compact form under the guidance of subject experts and experienced faculty of ADDA247 and Team and contains 1800+ questions with 100% solutions which will help the candidate to crack competitive exams with ease. This all-inclusive book incorporates all types of latest Questions being asked in recent examinations of Railway JE , NTPC , SSC JE , SSC CGL and other Exams. Every subtopic and questions pertaining to them are discussed in detail. 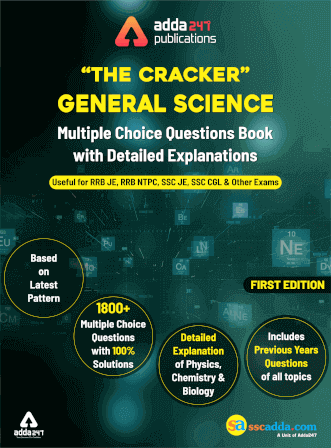 The Cracker General Science MCQ Book for RRB JE, NTPC, SSC and other Exams 2019 (In English Printed Edition)” at just Rs.249 is a unique compilation of exam oriented general science questions which extensively sums up Physics, Chemistry and Biology based topics and reinforces the concepts in aspirants’ mind with various types of questions duly categorized into Distinct Questions and Previous Year Questions. General Awareness plays a game changer role in all the prominent government exams. In the wake of this, Cracker General Science multiple choice questions book edition cherry picks the gems of new pattern based questions for the exams you are preparing for. The best appreciating effort behind writing this book is to guide you comprehensively by providing imperative study material for all the major government exams to up your game.